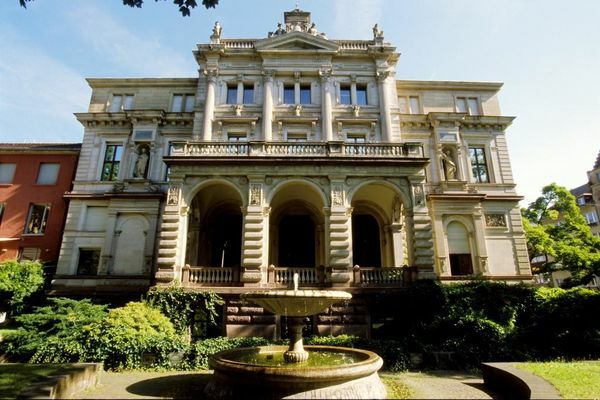 The Baden Society of Art was founded in Karlsruhe in 1818 and is thus the second oldest art associa­tion in Germany. The associa­tion has actively presented and promoted contem­po­rary art since the beginning of the 19th century through to the 21st century. 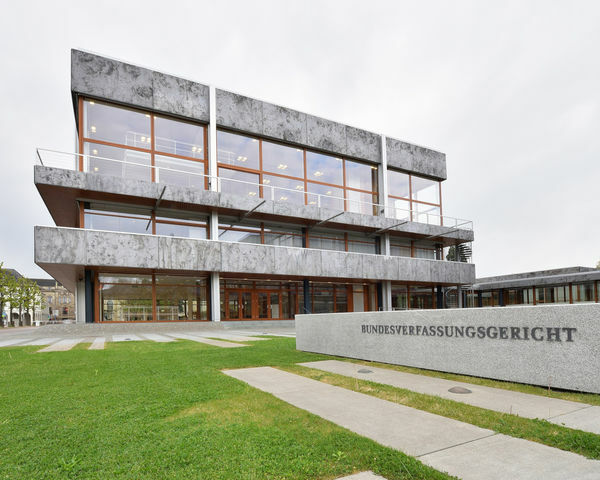 The Baden State Library is a scientific, universal library that takes its work as a museum seriously: Each year, four to five exhibitions are presented in its halls. 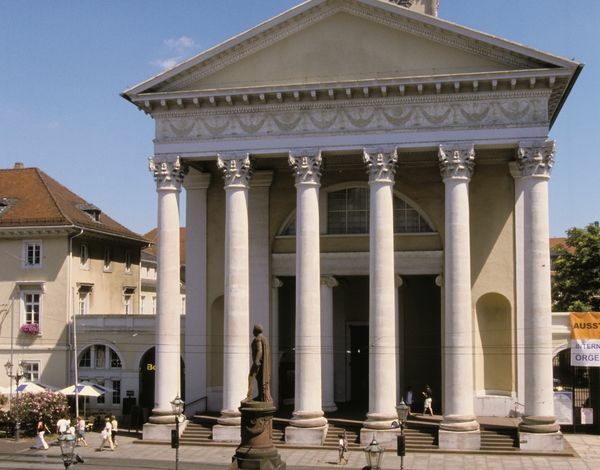 The Baden State Theatre is located next to Ettlinger Gate and is divided into three sections (three fixed venues in two buildings). 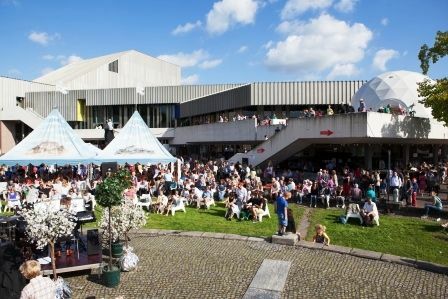 One building, right next to Ettlinger Gate, houses the opera house (Opernhaus) and the playhouse (Schauspielhaus).The second building, the island at the Charles Gate, features mainly modern theatre pieces and contemporary concert performances. D’Badisch Bühn enjoys a long tradition in the Karlsruhe arts scene. 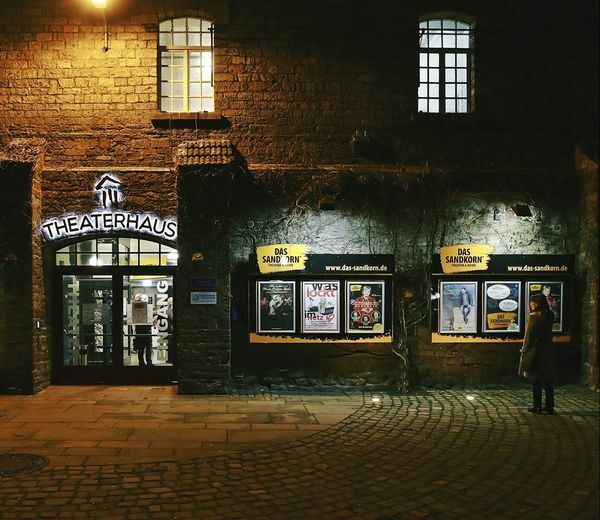 Its directors, Thomas Munz and Jürgen Hörner, have been successful in pursuing the vision of its founder with a schedule of plays for every month of the year and every age group. The botanical gardens contain over 20 special species of trees from a variety of continents, conservatories containing cacti and numerous greenhouses with tropical plants. 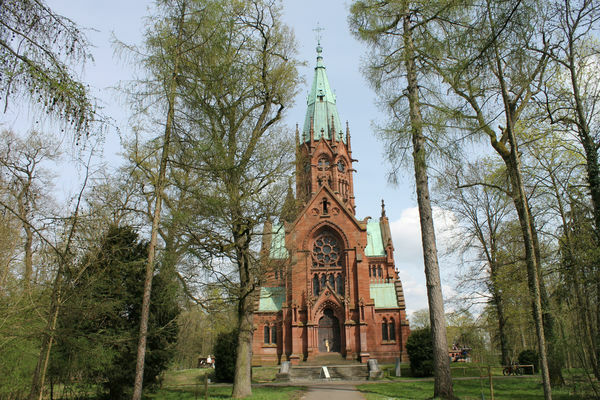 The mausoleum is hidden along Lärchenallee in the Hardtwald forest and was originally erected at the request of Frederick I, Grand Duke of Baden and his wife, Princess Louise of Prussia, on the edge of the Karlsruhe “Pheasant Gardens”. Special tours of the Burial Chapel of the Grand Duke are available to visitors. 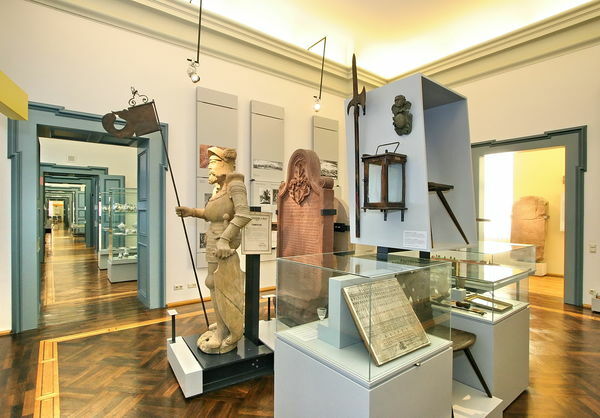 The Karlsruhe City Museum is located in the rooms of the Prince Max Palais (Karlstraße 10). The museum offers guided tours through the permanent collection. Alternatively, check out the changing schedule of special exhibitions. The Ettlinger Tor shopping center houses 130 shops, cafes and restaurants across a shopping area measuring 33,000 sq m (336,000 sq ft) – a dream come true for any shopaholic. The Ettlinger Tor is an extension of the pedestrian area and whatever it is you’re looking for, you’re almost certain to find it here. The unique brightly lit indoor boulevard boasts three lavish levels, offering a variety of fashion outlets, the latest trends and accessories, beauty outlets, bookshops and consumer electronics. 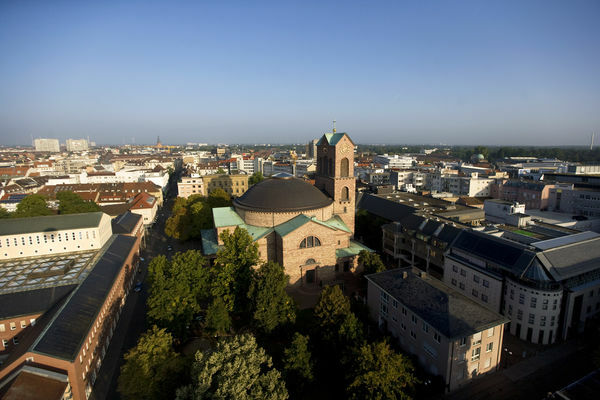 The municipal protestant church (evangelische Stadtkirche) was built according to plans by the famous Karlsruhe architect Friedrich Weinbrenner as the cathedral church of Baden following instructions from Grand Duke Karl Friedrich. 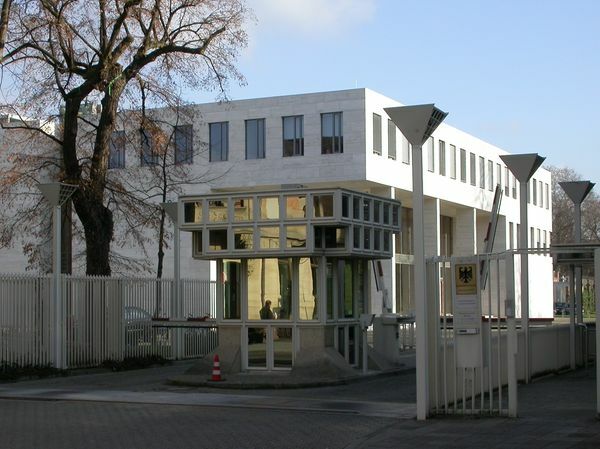 The Hereditary Grand Duke's palace in Karlsruhe has been the office building of the president of the Federal Court of Justice (Bundesgerichtshof) since 1950. 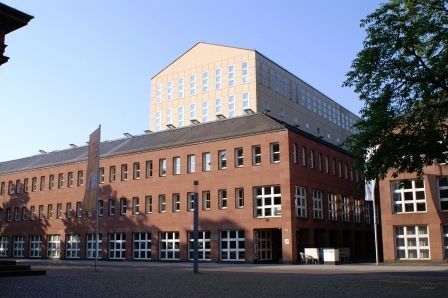 It is the highest court of civil and criminal jurisdiction in the Federal Republic of Germany. 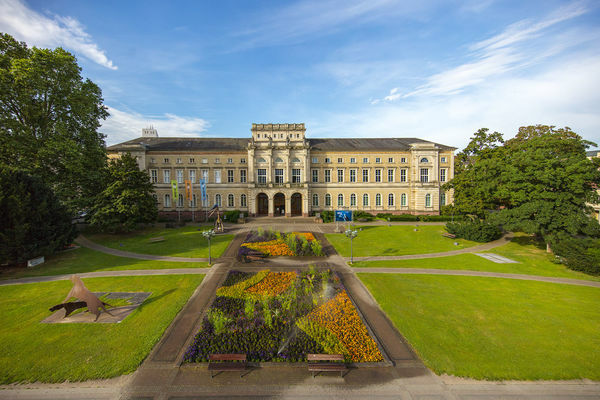 The General State Archives Karlsruhe are responsible for the safekeeping of old official records for the district of Karlsruhe and other regional authorities based in the city. This includes court files, documents from local authorities, certificates, archives from monasteries and knightly orders, church files, etc. Many royal and private archives are stored there as well. Schloss Gottesaue is a small, often destroyed and reconstructed Renaissance palace in "Ostauepark" of Karlsruhe's Oststadt district. 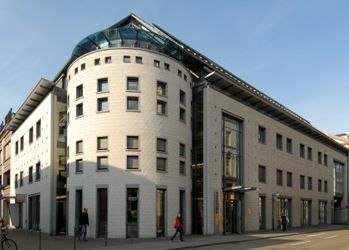 The Karlsruhe University of Music has been located here since November 1989. 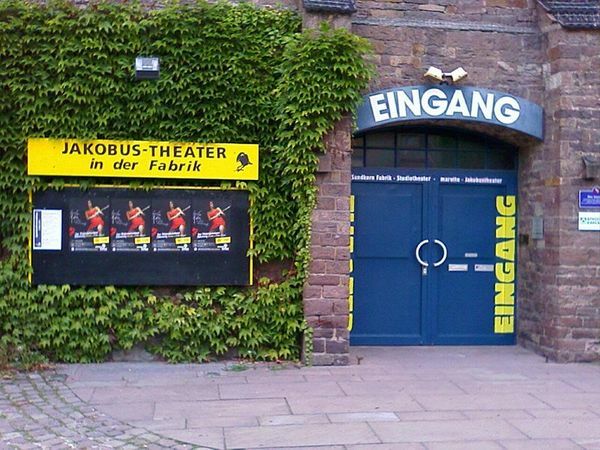 The Jakobus Theatre was founded in 1972. As an amateur theatre, it is unique in its work with professional directors. Performances take place in the Fabriktheater, an old municipal building at Kaiserallee 11, also home to the puppet and “Sandkorn” theatres. Kaiserstrasse is the main shopping area in the Karlsruhe city centre. It is brimming with retail outlets, shops, cafes and snack bars. 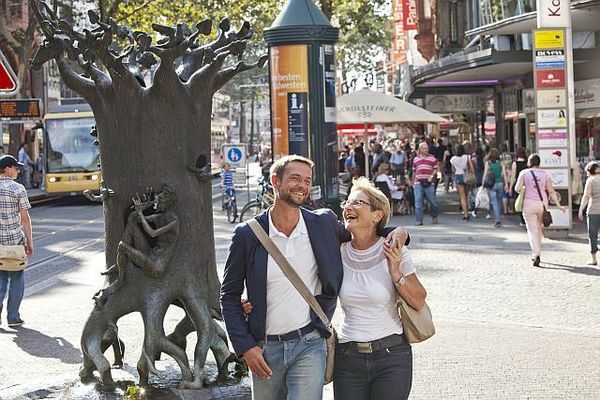 Enjoy a leisurely stroll down Baden’s longest shopping boulevard. The Karlsruhe Kammertheater is a private theatre with space for up to 250 seated visitors. Its season spans from comedies to classics and even musicals. The lead roles are often played by famous actors such as Ingrid van Bergen, Dorkas Kiefer, Ralf Bauer and Richy Müller. Right in the heart of the city: Karlsruhe Convention Center. 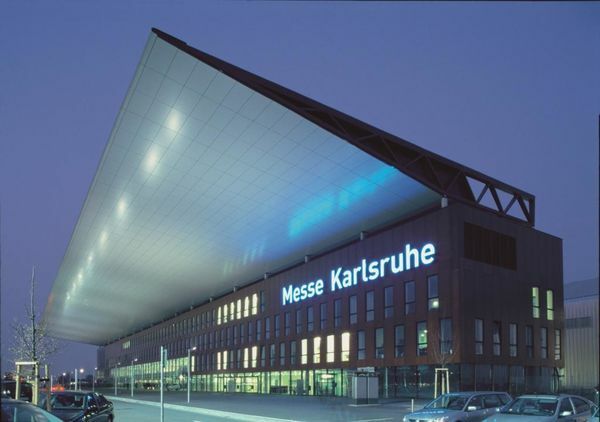 Four world-class locations and an exhibition area covering 20,000 m2 – one of the biggest venues of its kind in Germany. With enough capacity for up to 13,100 guests. It’s the perfect place for dynamic dialogue and constructive communication. Work on Margrave Karl Wilhelm of Baden-Durlach's new residence, "Carols Ruh", in the middle of the forest began on 17 June 1715. 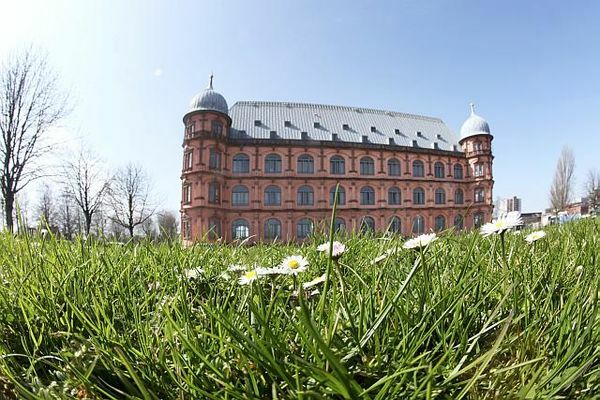 What was initially planned as a summer residence soon became the first and central building of the new town of Karlsruhe. 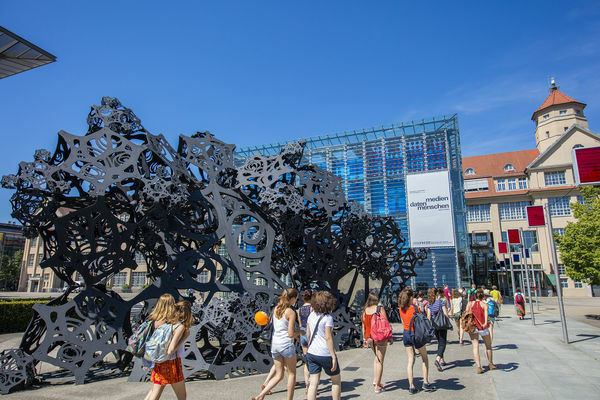 With 52,000 m2 indoor exhibition area and 62,000 m2 open-air exhibition area, Karlsruhe Trade Fair Center has been stunning exhibitors and visitors alike since its opening in 2003. The modern infrastructure, user-friendliness and award-winning architecture combine to make your trade fair visit one to remember. 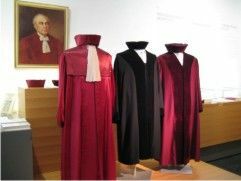 The Legal Historical Museum Karlsruhe is located in the federal court in the city center and provides an overview of the historical development of the law. 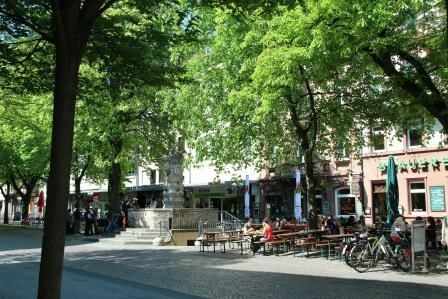 Ludwigsplatz is one of the most popular squares in the west of Karlsruhe’s historic city centre. Countless restaurants, bars and cafes draw in crowds for relaxation or a cocktail after work. The motto: "See and be seen". At the west of the Kraichgau between Bruchsal and Weingarten there is the Michaelsberg with its distinctive white chapel. Here you have a wide and broad outlook in the Upper Rhine Valley. The Museum of Upper Rhine Literature presents the variety of literary life on the Upper Rhine. 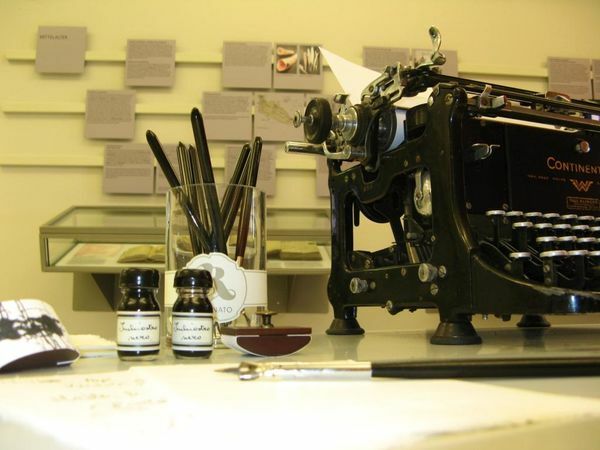 Exhibitions like handwriting, first editions, letters, photography and audio artefacts are supplemented by modern media technology. 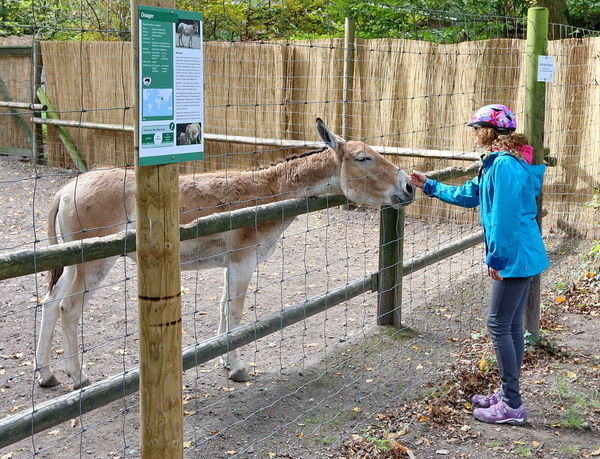 Oberwald Zoo was created in 1965 to make space in Karlsruhe zoo and the city gardens for the Federal Garden Show. Today it is an integral part of the city’s attractions and cultural offering. 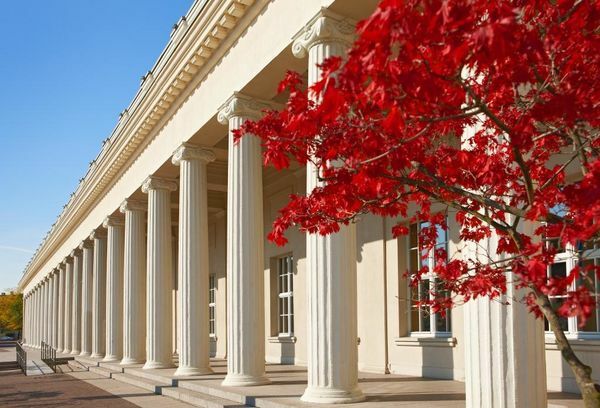 The railway in the palace gardens runs every year from Good Friday to All Saints Day, on weekends and holidays. Between the end of May and the beginning of October, the train also runs on weekdays. A complete trip takes about 20 minutes. 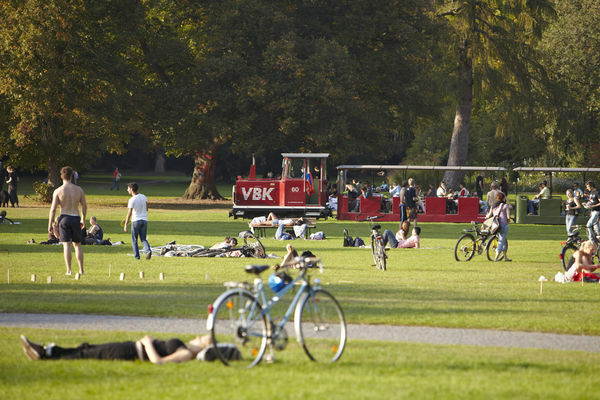 The ‘little railway’, as it is affectionately known, is very popular among the people of Karlsruhe and visitors. 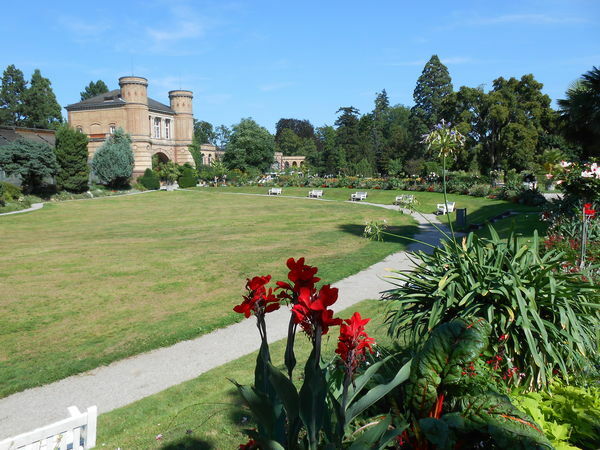 Karlsruhe’s palace gardens cover a large area directly behind Karlsruhe palace. The gardens were laid in 1967 to mark the Federal Garden Show and were designed to resemble an English landscape garden. 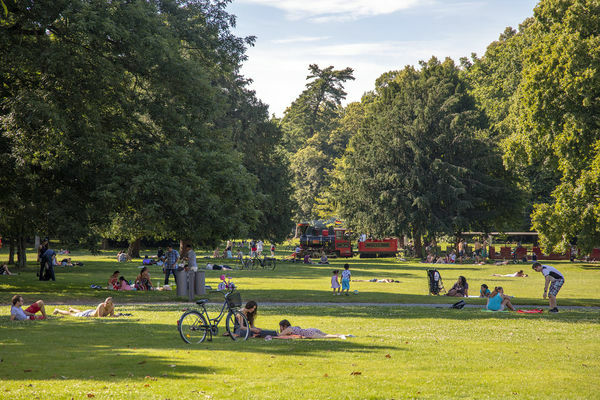 It is a popular meeting place for picnics, sport, an extended stroll, or just to get away from the stresses of daily life. The Pfinzgau Museum,which is located in rooms inside the Baroque Karlsburg (entrance B), illustrates the history of the city of Durlach, which remained a “free city” until 1938. The exhibits include various works of art, cultural objects, and accounts of everyday life. The Post Galerie is housed in the former Karlsruhe post office and has to be one of the most beautiful shopping galleries in Germany. 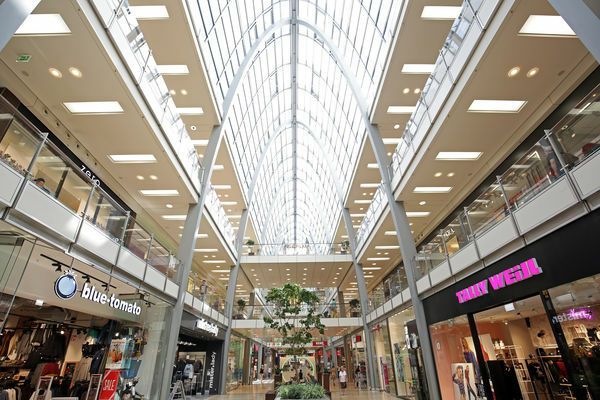 Bright, spacious, modern and well maintained, it is the region’s most beloved and unique shopping mall, featuring over 60 different specialist shops, retailers and restaurants. 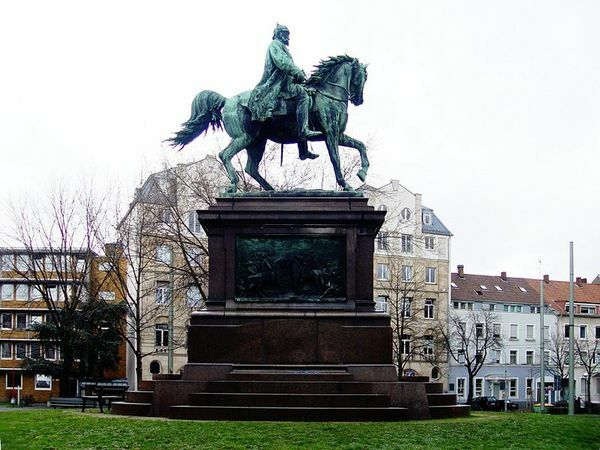 The ‘Platz der Grund­rech­te’ was laid in 2005 between the perimeter road called Zirkel and Schloss­platz (the palace square). 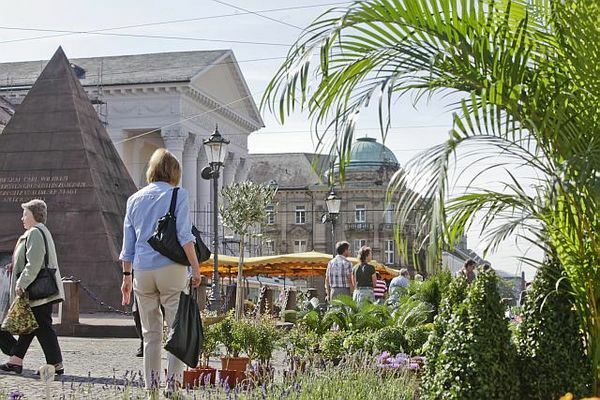 Walking through the pedestrian zone, it can be found between Marktplatz and the palace. 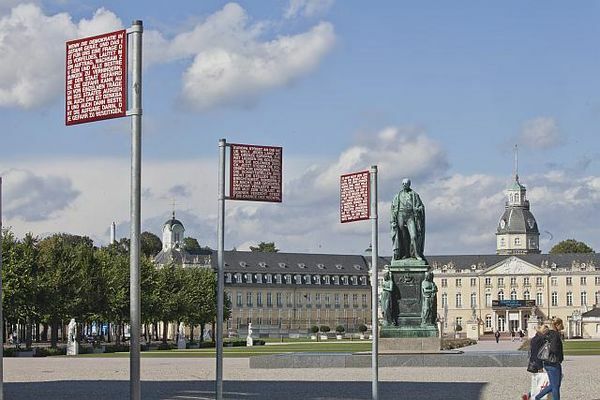 The square is dotted with 24 double-sided street signs, each describing an important aspect of right and wrong – complete with statements made by judges, lawyers and common citizens who have come into conflict with German law. St. Stephanis the oldest catholic church in Karlsruhe. It was built byFriedrich Weinbren­­ner as a parish church in 1814. 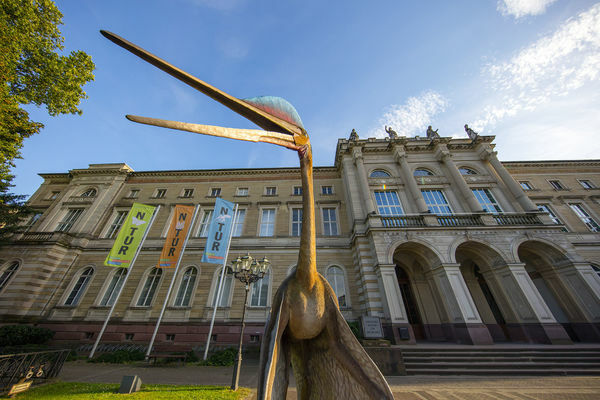 The State Museum of Natural History in Karlsruhe is fascinating for all ages. 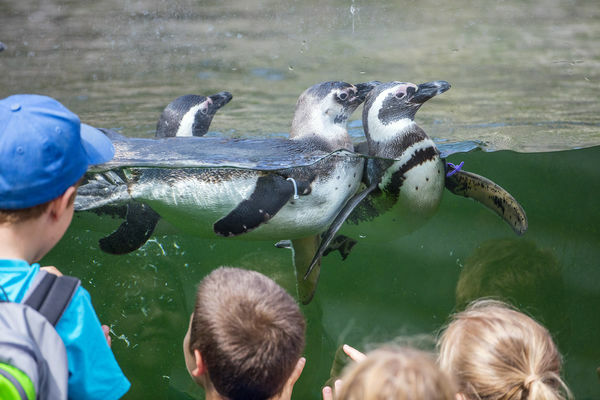 The museum houses a variety of exhibitions and the vivarium showcases local and exotic fauna and flora in life-like settings. 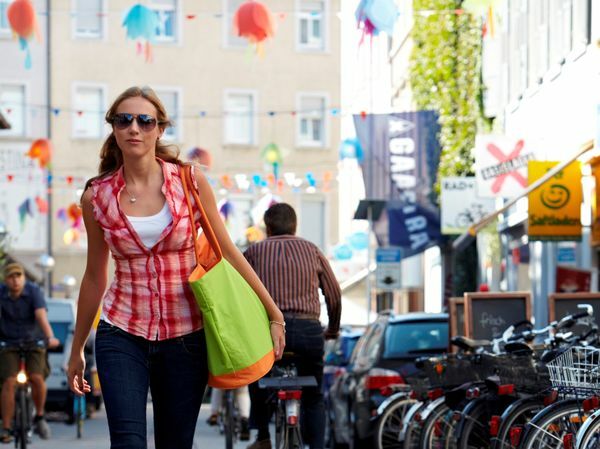 With its tantalising mixture of stylish boutiques and shops featuring handicrafts, furniture, designer products, bike gear, sailing and outdoor equipment, premium fashion outlets, galleries and jewellery stores, the 'Südliche Waldstraße' is a must-see destination during a shopping visit to Karlsruhe. 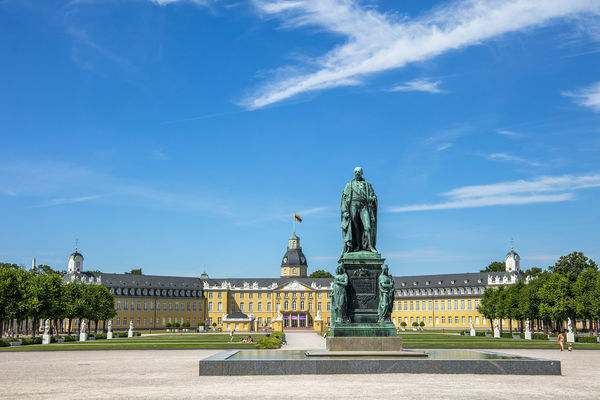 Karlsruhe has been the symbolic ‘home of lawmaking’ – a key role for the modern, democratic state of Germany – for more than 50 years. Germany’s uppermost judicial bodies are based in Karlsruhe: the Federal Consti­tu­tio­nal Court, the Federal Court of Justice and the Federal Attorney General. In German news it is common to hear that a decision has been taken after a ‘Judgement in Karlsruhe’. The Majolica Porcelain Manufactory Museum, a sister museum of the Baden state museum situated in the former administrative building of the Maiolica workshops, provides an excellent overview of the production of the grand-ducal manufactory, which is now run by the state. 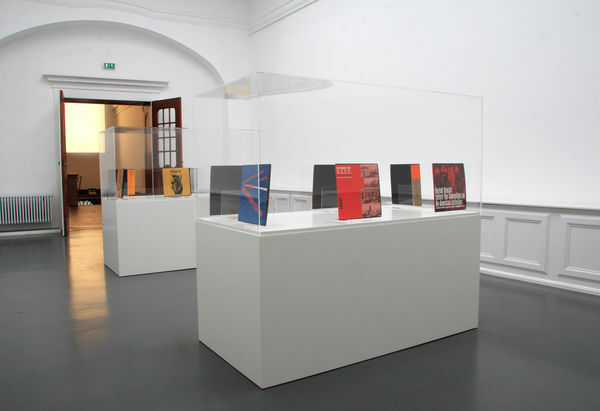 The exhibitions span from its inception to the present. The Marotte Puppet Theatre has had a permanent stage in Karlsruhe since 1987 and is sponsored by the city of Karlsruhe and the State of Baden-Württemberg. 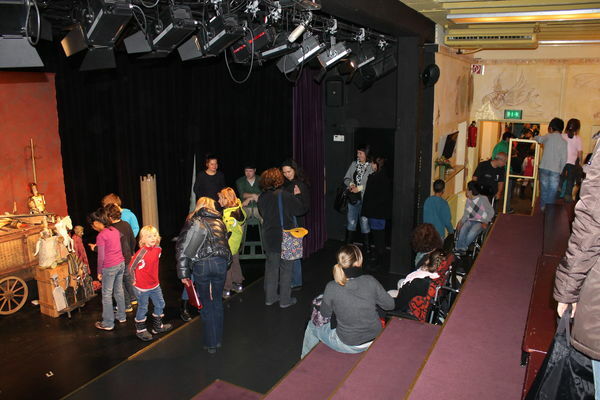 The venue presents approximately 300 shows as part of its children’s and evening schedule. 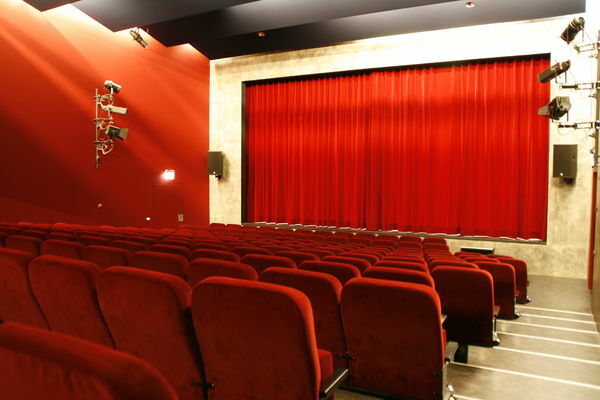 In addition, the theatre puts on guest performances all over Germany and Europe. 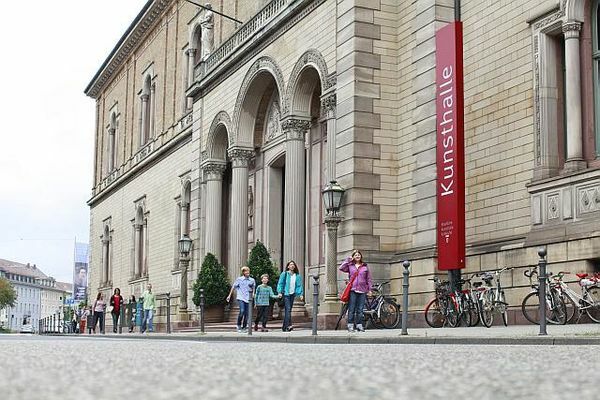 The Municipal Gallery specialises in the works of local Karlsruhe artists and painters from the surrounding area. It also showcases European drawings and prints from between the 15th and 19th century, fine Japanese woodcuts of the 18th and 19th century and works from the Garnatz collection. 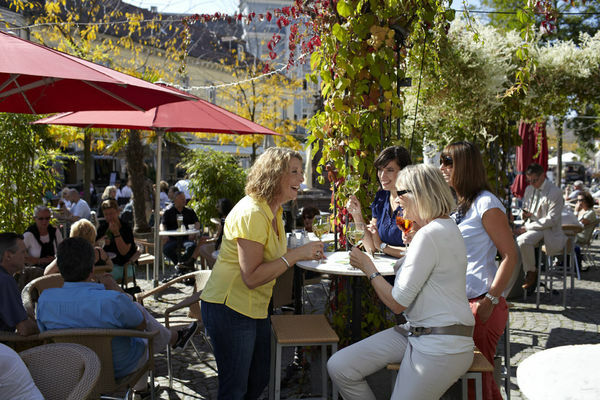 The Baden State Museum has been in charge of the Museum on Marktplatz since 1993. 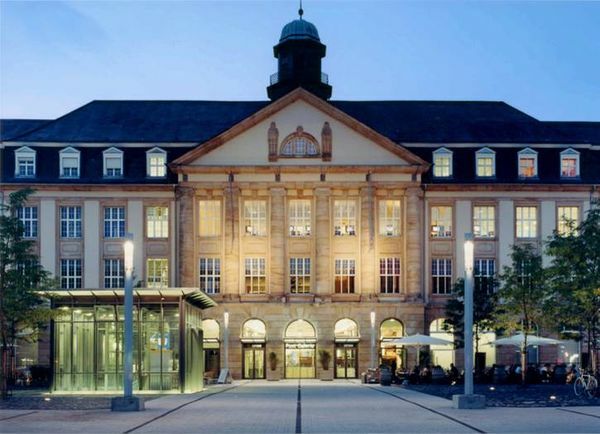 The museum is located right at the heart of Karlsruhe in the former publishing house of Badischen Neuesten Nachrichten (Baden News). 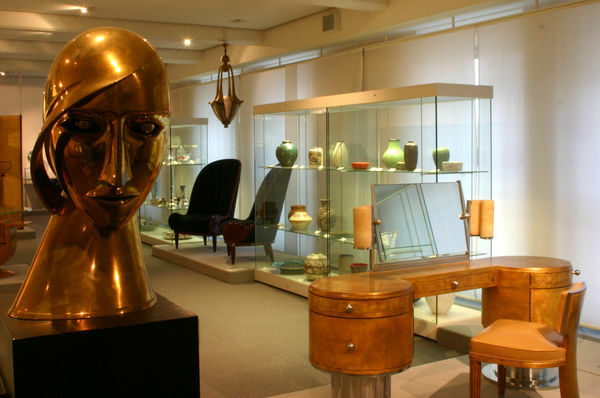 The Museum hosts a unique collection of applied art from the turn of the century. 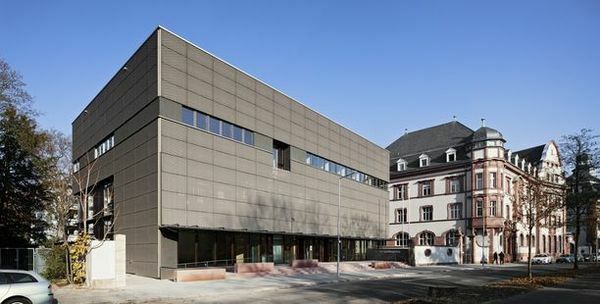 The Sandkorn Theatre, which literally translates as Sand Grain Theatre, is a professional private playhouse in Karlsruhe. Its programme includes a broad spectrum of shows from children’s and youth theatre, acting, musical theatre and cabaret. The State Art Gallery (Staatliche Kunsthalle Karlsruhe) in Karlsruhe sees itself as an agent between the past, present and future. It does not focus exclusively on preserving the legacy of several centuries, but aims instead to establish a modern dialogue with the historic collection and its valuable extension. 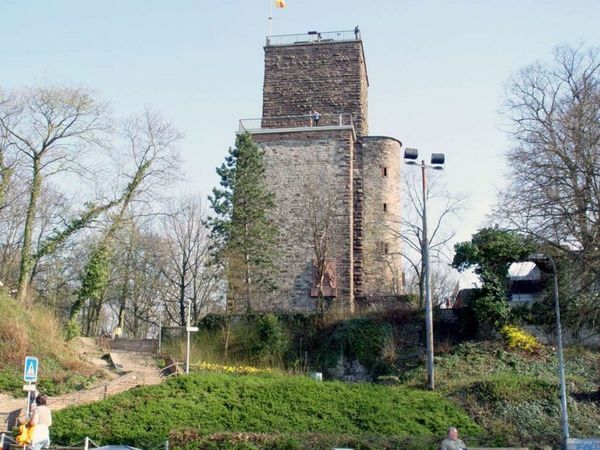 The Turmberg is the local hill of Durlach, the former royal seat of Baden. 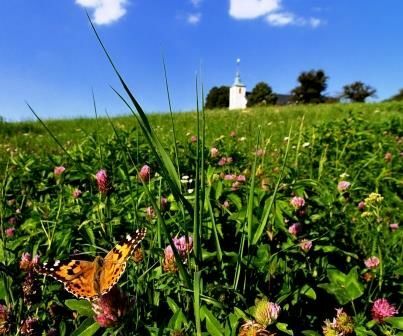 It is 256 metres high and forms the nortwesternmost peak of the Black Forest at the transition between the low maintain range and the hilly landscape of the Kraichgau region. The Turmbergbahn is a funicular railway that connects the district of Durlach with the Turmberg. The train scales 100 metres in height over a stretch of 315 metres at a maximum incline of 36.2%. 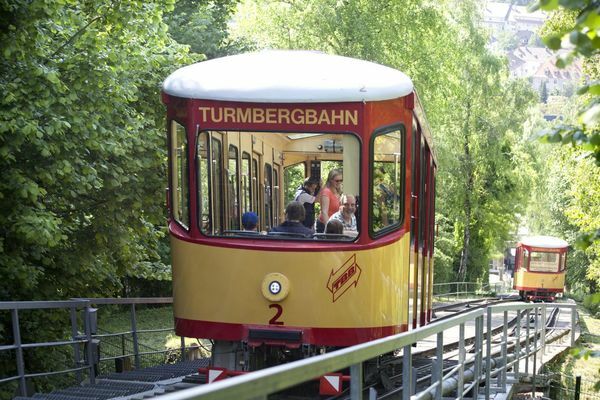 It first opened for operation in 1888, and is thus the second oldest funicular railway in Germany. 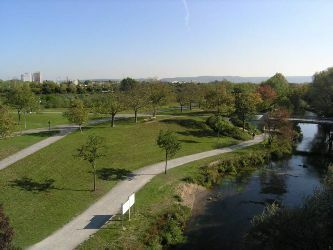 The Werderplatz is a living place and the cultural centre of southern Karlsruhe. Here you find multiculturalism and alternative stores and bars. There are shopping possibilities, the culture centre KOHI and the "Indianerbrunnen" ("Indian fountain") - the landmark of southern Karlsruhe. A lot of inhabitants love the awareness of life there. 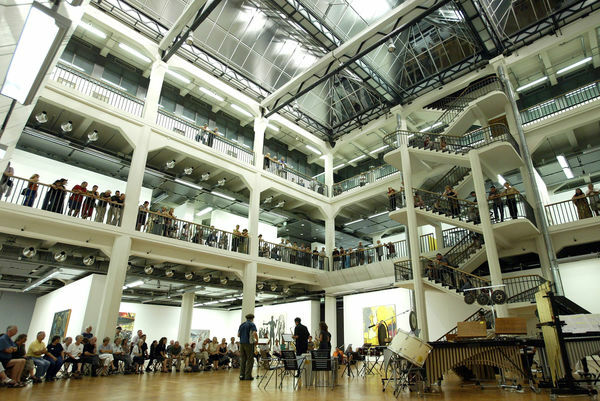 The Center for Art and Media (ZKM) is a unique kind of cultural institution not found anywhere else in the world. Its aim: to act on fast-paced IT developments and changing social structures. Its work combines production and research, exhibitions and events, procurement and documentation.